Fans of two franchises that featured the ultimate in futility for so many years might find it interesting that right-hander Bill Fleming pitched for only two major-league teams: the Boston Red Sox and Chicago Cubs. He didn't have a winning record for either. The family moved to Pasadena when he was about 5. Bill's father, Frost F. Fleming, had a blacksmith shop there.2 The census says he was superintendent for a water company. Both Frost and his wife (Bill's mother) Jennie were California natives. Leslie was their third child. Both Margaret and Ruth preceded him. Around 1922, Viola Fleming was born as the fourth child. By then, the family had settled in Yuba, Sutter County, north of Sacramento, and Frost had taken up farming. Young Bill went to eight years of grammar school in a two-room schoolhouse, then two years at Sutter City High. Thus ended his formal education. He had pitched in grammar school and then in high school, where he also was the quarterback on the football team, then played semipro ball in the East Side Valley League and the Sacramento Valley League for two more years. "Times were tough then…I didn't graduate; I just went two years and I quit and went to work…In 1934, when liquor first came back, I bought a bar and a restaurant in Yuba City and I played in the Sacramento Valley League with the Yuba City Bears and went over and played with the Marysville Giants. "3 If he'd not gone into baseball, he would have gone into civil service working for the U. S. Forestry Service – or so he said when completing a player questionnaire for the American League Service Bureau.4 He stood an even six feet tall and is listed at 190 pounds. In August 1934 he married Priscilla Day. His uncle, David P. Fleming, was president of the Los Angeles Angels.5 Bill went to spring training with the Angels that year. The manager sent him home and said, "Forget about being a ballplayer; you'll never make it." The San Francisco Missions came to Marysville for spring training and Fleming worked out with them, getting into one game against Oakland. That winter he was invited to come to San Francisco and pitch for them in the winter league. At the end of the winter, they signed him to a contract. Fleming's first year as a professional was in Oklahoma in 1936, optioned to the Muskogee Tigers of the Class-C Western Association. It was his first time out of California. He was 12-11 in 28 games (5.70 earned run average). He turned the bar over to his father, who sold it during the season. "I was glad to be out of it," he said, "I didn't belong in that type of business. "6 Fleming started 1937 with the Mission Reds but he wasn't used much, so in July he asked manager Willie Kamm if he'd send him out so he could get some work; Kamm consented and Fleming primarily pitched for the Vancouver Maple Leafs in 1937 (11-6, 5.08) and was a 20-game winner for the Bellingham (Washington) Chinooks in 1938 (20-11, with a superb league-leading 1.79 ERA, in the Class-B Western International League.) His 20 wins also led the league. Bellingham finished in second place, but won that year's league playoffs. He joined the Tigers for spring training 1940, but was returned to Hollywood in April. Fleming won 17 games for the Stars with a 2.77 ERA,and was leading the Pacific Coast League in strikeouts when he was purchased by the Boston Red Sox on August 12. He cost the Sox two players and cash thought to be $25,000. The Sox were only six games behind the Cleveland Indians at the time, and hoped that adding the PCL ace would give them a boost. Bob Cobb, one of the owners of the Stars, had recommended Fleming to Red Sox scout Herb Pennock, who'd traveled westward to look over pitcher Larry Powell.9 Fleming talked with Sox GM Eddie Collins and got a salary of $1,000 a month plus the promise of an airplane ticket back to California at the end of the season. Fleming's big-league debut came in Boston on August 21, allowing just one hit while pitching the ninth inning in relief. He started against the Tigers on the 24th and gave up seven runs in eight innings, a no-decision. He'd been leading the game until the top of the eighth, but then coughed up four. (Ted Williams pitched a couple of innings in the first game of this day's doubleheader, a 12-1 Red Sox win.) On August 28 he started and allowed just three hits in seven innings of work, but the White Sox broke a 2-2 tie to win after he'd departed the game. Fleming lost two games – a start on September 2 and in relief on the 19th, finally securing his first win in his last appearance of the season, a 9-4 complete-game win against the visiting Athletics on September 29. He finished with a 4.86 ERA. The Sox remained high on him heading into the 1941 campaign. His first win came in 6 1/3 innings of one-hit relief on April 26. "Fireman Fleming" also doubled to drive in Boston's first run.10 It was his only win of the year, balanced by one loss. Fleming only had one start among his 16 appearances. His ERA was 3.92. On July 2 the Red Sox recalled Tex Hughson from the Louisville Colonels and optioned both Emerson Dickman and Bill Fleming to Louisville. He had some good memories of his time with the Red Sox, though, including the time four Red Sox players, including Ted Williams and Dom DiMaggio, decided to visit the FBI headquarters in Washington. They met J. Edgar Hoover in his office and wound up in the shooting gallery in the basement of the building, firing submachine guns. He was 6-6 in 20 games for the Colonels. On December 22 his contract was sold outright to the Chicago Cubs. 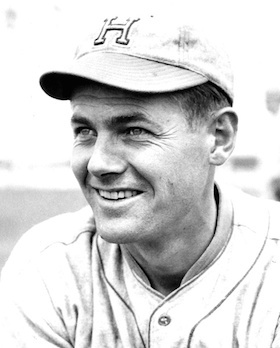 Fleming stuck with the Cubs for the full 1942 season, with a one-hit shutout of the Boston Braves on June 13 his best outing. "A Masterpiece!" read the heading on the Chicago Tribune box score. The lone hit by Tommy Holmes came in the sixth inning, a Texas Leaguer that dropped in. He threw a two-hitter against the Pirates in August. The most unexpected turn had been in an exhibition game on May 4 when he switched uniforms for the game and pitched for the U.S. Navy team at the Great Lakes Naval Training Center against his own teammates. He finished the year 5-6 for the Cubs, with a very good 3.01 earned run average. In 1943 he pitched for the Cubs through June 23 (0-1, without a start, and 6.40 in ERA), then spent the rest of the season farmed out to the Milwaukee Brewers. He was 8-6 (3.80) for Milwaukee. He spent 1944 with the Cubs, started 18 of his 39 appearances, won nine, lost 10, and had a 3.13 ERA. Only Claude Passeau's 2.89 was better on the team. The better to integrate their returning veterans, the Cubs scheduled a "reconversion camp" at Lake Worth, Florida, beginning on January 15, 1946. Fleming cautioned not to expect much from the returning players, simply because none of them – even those who, like himself, had seen a lot of service baseball – had faced much in the way of stiff competition while away from the professional game.14 That proved true in Fleming's case; even though he'd won 11 games for Fort Lewis in 1945, he didn't win any for the Cubs in 1946, his last year in the majors. He was 0-1 with a 6.14 ERA, when he was optioned on July 20 to the Los Angeles Angels. He was 9-5 for the Angels, and 11-6 in 1947. At the time of his 1996 interview, he was wearing his 1947 PCL championship ring. In 1948 the Angels released Fleming right at the start of the season, but he signed on with the Portland Beavers and pitched for them for the rest of his playing career, working almost exclusively (except for 10 starts in 1949 and one in 1950) as a reliever. He voluntarily retired after the 1951 season, and became a coach for the Beavers in 1952 and 1953, appearing in two games in 1953 (1-0). Fleming continued as pitching coach through the 1956 season. He had a pilot's license and flew his own private plane for a number of years. From 1954, he worked as Superintendent of Maintenance and Parts Sales Manager for On Mark Engineering of Van Nuys, California, a company that specialized in converting military surplus airplanes. His first wife died in 1948; in 1949, he married Geraldine Wash. In the 1960s he moved to Reno, Nevada, to manage the U.S. Mining, Inc. ball team based there. After retiring, Fleming lived in Reno and died there at an assisted-living community, of natural causes at age 92, on June 4, 2006. He was survived by his four children -- Larry Fleming of Powder Springs, Georgia; Sheri Schnack of Honolulu, Hawaii; Dixie Fleming of Oroville, California; and William Fleming. 1 Ed Rumill, "Bill Fleming Shows Ability on Red Sox Pitching Squad," Christian Science Monitor, March 18, 1941: 12. 2 Much of the information about Fleming's family life comes from the 1996 SABR oral history interview by Dwayne Kling. 4 The questionnaire is a part of Bill Fleming's player file at the National Baseball Hall of Fame. 5 See, for instance, "Get Acquainted with Chinooks," Bellingham Herald, June 9, 1938: 14, and, under the heading "The Owner's Nephew Makes Good," San Francisco Chronicle, June 21, 1940: 19. Bob Ray of the Los Angeles Times reported that Fleming would have been with the Angels except that manager Jack Lelivelt didn't think he had the stuff. See Bob Ray, ""The Sports X-Ray," Los Angeles Times, June 16, 1939: 25. 8 Bob Ray, "Hollywood Stars Sell Bill Fleming to Detroit Club," Los Angeles Times, September 10, 1939: A9. He had been recommended to the Tigers by Marty Krug. 9 "Hollywood Boss Boosts 'Rubber Arm' Fleming, unidentified newspaper clipping in Fleming's Hall of Fame player file. See also Bob Stevens, "We Want Dasso Club Formed," San Francisco Chronicle, August 15, 1940: 20. 10 Hy Hurwitz, "Sox Spot Seven Runs – Win By 8-7," Boston Globe, April 27, 1941: B24. 11 L. H. Gregory, "Greg's Gossip," The Oregonian (Portland), November 4, 1945: 36. 14 Wilbur Adams, "Between the Sport Lines," Sacramento Bee, January 29, 1946: 8.